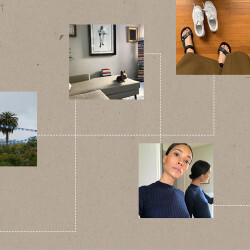 Hemsley & Hemsley school us on the comfort food-turned-superfood. 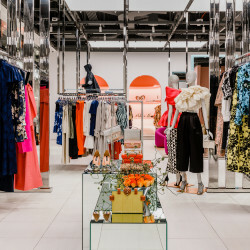 We’re always looking for the next big elixir to solve all of our health complaints and turn us into Gisele, but when bone broth started cropping up everywhere, well, we kind of scratched our head. We mean, soup from chicken stock kind doesn’t seem all that magical. But, kids, were we wrong, because bone broth seems to be about as miraculous as foods come (plus it’s comforting and tastes damn good) and helps with everything from glowing skin to minimizing cellulite. 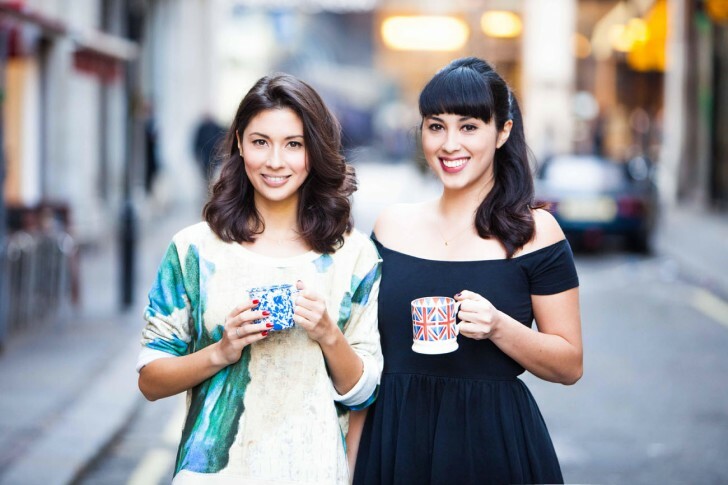 So, we couldn’t help but call up Jasmine and Melissa of Hemsley & Hemsley for their expertise. And are they ever—experts, that is—giving us the downlow on what the broth does for you and even providing a couple recipes so we can make the stuff ourselves. Now, if you’ll excuse us, we’re heading to the butcher’s so we can spend our Sunday boiling bones. 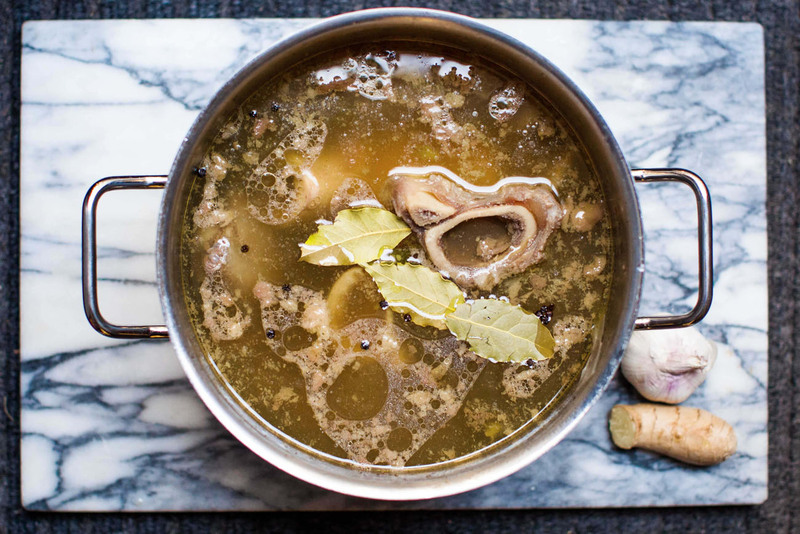 Bone broth is our secret weapon and kitchen staple. (It’s also featured in many of the 165 recipes from our book, The Art of Eating Well.) A pot of simmering broth (or ‘liquid gold’ as we now like to think of it!) was a familiar sight in our kitchen growing up—the bonus result of a Sunday roast (nothing ever going to waste where possible). Bone broth is our elixir for glowing skin. We see it as an all-rounder: packed with vitamins, minerals, collagen and keratin, making it amazing for skin, digestion and even dreaded cellulite! It’s a gut healing, easy to digest source of nourishment and energy that doesn't make you crash or give you caffeine-like jitters. And if we've got the sniffles then bone broth is the perfect food with some fresh ginger and garlic grated it. For us it’s just bones, water and a long simmer. A few bay leaves if we have them and a squeeze of something acidic like lemon juice or apple cider vinegar to help further extract nutrients. 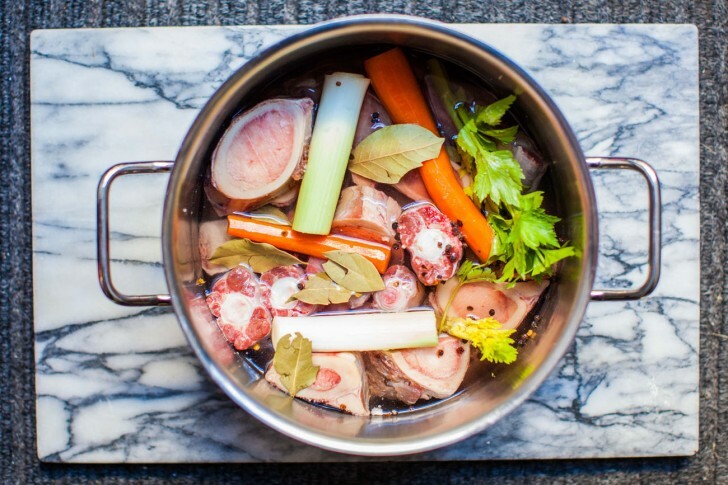 On a day-to-day basis, for our business (private clients and event catering for luxury brands like Louis Vuitton and CHANEL) we make chicken and beef broth. This is a good place to start for newbies but lamb, game and fish (rich in iodine) is also delicious. 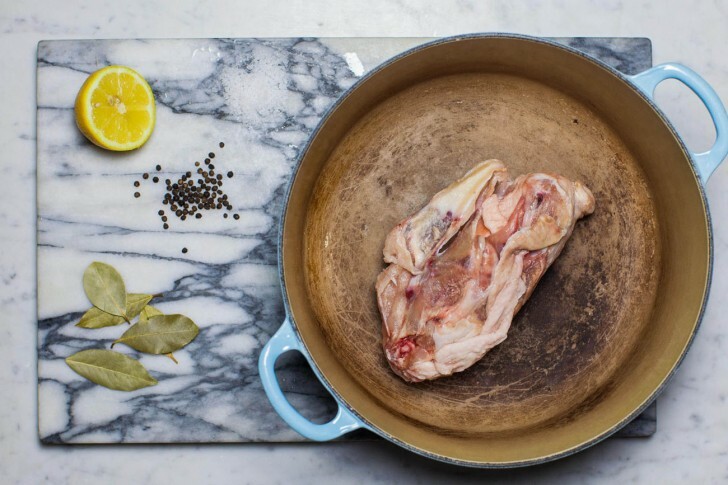 If we’ve enjoyed a meat roast, bone marrow or oxtail meal, we’ll save the bones and throw them in a pot for later so nothing is wasted. Add veggie scraps (like onion and celery, not brassica veg though) if you have any on hand. If you’re new to making bone broth, then you might want to embellish it with aromatics such as carrots, leeks and peppercorns. We’re often asked about the difference between between ‘bone broth’ and ‘stock.’ Once upon a time they were the same thing, but nowadays stock can mean stock cubes, bouillon powder, veg stock and even ready-made ‘fresh’ stocks sold in packets and cans in supermarkets. These types of stock are produced for flavour, not always made from good ingredients or even made from bones. Even a traditional stock from classic cooking will have only been cooked for 3 hours, as opposed to the 6-24 hours of simmering needed to extract the goodness that we’re after. 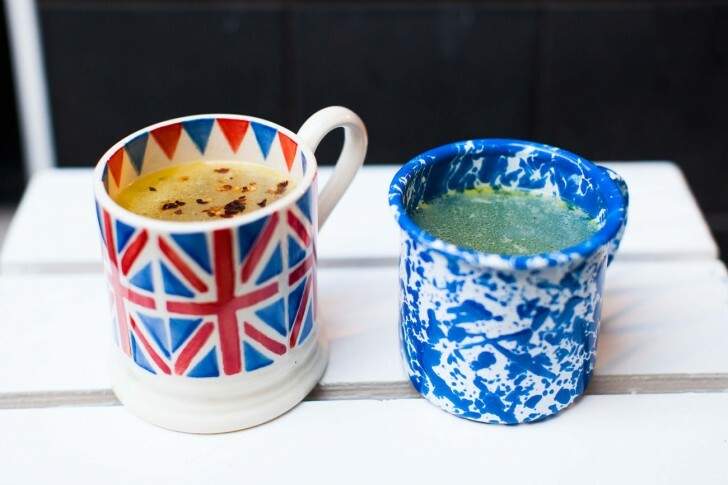 The fact that bone broth is delicious and makes a quick and tasty meal come together in minutes, as well as making a wonderful drink to enjoy as is, means that this is one health food that everyone embraces once they understand it—not as something to grin and bear, but as one you can look forward to as much as a cup of tea! Just like green juice is the super concentrate of green vegetables, bone broth is the essence of goodness that only animal foods can offer. Potent, enriching and overflowing with health benefits, it’s perfect for the colder months when you may not want to drink cold juices or smoothies. We love sipping ours straight from a mug as a soothing bedtime drink or for a restorative drink post workout. It also makes a hydrating start to the day. We’re happy to see this forgotten superfood becoming popular once again. It is, of course, one of the oldest foods in history! Since man invented fire and a cooking pot, it enabled him to extract all the otherwise inaccessible nutrients that previously remained locked within bones. Across cultures broth is the basis for many types of cuisine—think Vietnamese Pho, Chinese egg drop soup, Japanese ramen, Jewish chicken soup, Russian borscht, Polish rosol, Italian broth (brodo). And by throwing in the odds and ends of vegetables and even leftovers you end up with many new varieties of soups and stews—food that is easily made in large quantities, hard to spoil and easy to reheat. Its resurgence comes at a time when we are starting to understand the gut as the centre of immunity. We are recognising animal bones as a significant form of protein, collagen and minerals—all of which we splash out for in expensive supplements and face creams! As with any animal foods (and food in general) it’s all about provenance—a healthy animal is key for the nutrients that it can provide you. Source naturally reared and organic bones from a good butcher—free from synthetic hormones, pesticides and genetically modified feeds. Bone broth can be easily adapted throughout the week. The remains of a roast dinner on Sunday become a pot of simmering golden broth on Monday; blended into a vegetable soup it provides Wednesday’s fuss-free supper; and served straight up with a splash of apple cider vinegar, it’s antidote for Saturday’s hangover. It’s easily adaptable and a great base for so many types of meals or snacks. Delicious with just a touch of sea salt, we also like to soup it up with the addition of miso paste, chives, cilantro or chopped scallions and lots of black pepper. Beating an egg in while it’s heating up turns it into a smooth, rich and creamy drink (a great way to enjoy the benefits of eggs, especially for anyone that doesn’t like them!). Pre or post workout, stir in a raw egg yolk just before drinking for an extra boost to this already protein-packed, delicious way to start and end the day. As a tonic, it’s great with a dash of apple cider vinegar or squeeze of lemon juice. Most weekends we will have a ‘Sunday Cook Off’—a few hours of cooking in the kitchen on a weekend to get ahead and make meals for the working week. It’s a great time to make a big pan of bone broth on the stove, slow cooker or pressure cooker, then portion it up and freeze half—sometimes we freeze concentrated broth in ice cube trays so we can add them to sauces, scrambled eggs and dips. We keep the rest in the fridge in a big glass jar or covered jug and use it to cook up things like quinoa, steamed veggies, soups, stews, ragus, chillies and gravies. Place the bones and any optional ingredients into a large stainless steel or ceramic cooking pot and cover with cold water. The water level should cover the bones by 5 cm whilst still leaving room at the top of the pan. Fresh chicken carcasses from the butcher usually have a fair amount of meat on them. We tend to poach the carcasses for 20 minutes, or roast, then pull off the cooked meat (and save it for another meal like a chicken salad or chicken pho) before returning the carcasses to the pot and continuing to simmer to make broth. Freeze it batches for use during the week. Use glass containers and leave a few centimetres at the top for expansion. Small portions are great for cooking quinoa or braising vegetables, and larger containers are great for making batches of soups, curries and stews. Beef bones produce a lot of nutritious fat. (Skim some of it and save it for roasting vegetables.) Any leftovers can be stored in the fridge for up to three days or freeze the stock in a glass container. Bring the broth up to the boil and reduce to a simmer for a few minutes to heat through. Then turn off the heat.